As a company with a global reach in the dentistry field, Richmond Dental and Medical stays up-to-date on the issues and trends that define the foreign markets in the dental sphere. Perhaps the biggest event to shake up many commercial sectors in the last few years is Brexit, the media term for the United Kingdom’s withdrawal from the European Union. Dentistry will be no exception to this Brexit-triggered shakeup. 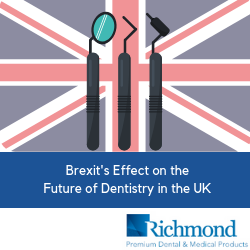 So just what will be the Brexit effect on the future of dentistry in the UK? While attending one of the largest international trade shows for the industry, IDS Cologne, the Richmond team met with the British consulate in Germany. Mr. Rafe Courage, Consul General at the consulate based in Dusseldorf, explained his country’s desired goals of Brexit to those gathered in attendance. First, the government wants to reflect the will of the British people, who voted by referendum to leave Europe. While the British people favor a European exit, both with the European Union and the Customs Union, they still desire a flourishing relationship post-exit. Furthermore, the UK government would like to see a continued “soft,” peaceful border between Northern Ireland, which is part of the exiting UK, and the Republic of Ireland, which will remain in the EU. While the government would like to see its former EU partners remain strong and united, its position remains to push a final negotiated Brexit plan through Parliament by March 29. If this negotiated exit, fails to materialize (and is currently in jeopardy at the time of this writing), the exit will be automatic and aligned to established World Trade Organization rules. It’s critical on a number of fronts that Brexit is allowed to happen in the best interests of all parties, as the EU accounts for 50 percent of British trade, while Germany is the UK’s second-largest trade partner after the United States. According to an article in Dental Tribune, Brexit—if implemented—will bring about multiple changes—some subtle and other far-reaching in impact. From a financial standpoint, leaving the bureaucracy would free up about 350 million pounds per week for increased funding for the UK’s National Health Service, and the country would have greater control over having to use value-added taxation rates on dental services. It’s also expected that the hiring of non-UK dentists, which has already decreased, will continue to fall in the wake of Brexit. However, the current shortage of dentists may mean a less protectionist stance in dentist recruiting to the island nation, in order to preserve access to good dental care nationwide. Easier to Do Business with Hospitals and Clinics? From an ease-of-doing business standpoint, NHS and other contracts will have far less scrutiny and less complex processes for vendors. The UK dental community may suffer as outsiders with regard to the EU, as it will lack access to EU-wide agencies and funding for resources like the European Medicines Agency. While neutral on the issue of Brexit, the British Dental Association points out many of these same issues, as well as the prospect of a hard border between the Republic of Ireland—a steadfast EU member—and the nation of Northern Ireland. The BDA illustrates that the current open border for the two current EU states means a flow of dental workforce in both directions. All of the complications associated with Brexit—the potential for border checks, the need for visas, and increased, differing regulations could have negative impacts on patients, dental professionals, the provision of service, and the availability of medicines and supplies. A Mass Exodus of Dentists? Finally, the British publication, Dentistry, reports that the human impact could be more extreme than previously thought. In a January article, Seb Evans shares results from a recent General Dental Council survey. In the survey, a third of UK dentists reveal that they are considering leaving the country in the next few years, directly due to concerns they have over Brexit. These concerns include the potential reluctance of British regulatory agencies to recognize credentials earned in foreign countries, as well as the burden of negotiating and renewing immigration status under a new regime. A staggering 84 percent think that Brexit is already causing dentists to leave. Even if that’s not the reality, this perception could become a self-fulfilling prophecy. With the uncertainty over whether Brexit will actually happen (as of this writing, there is no approved plan certified by the House of Commons, as required by UK law), the British dental community, like virtually every other industry, is roiled with negativity right now. Assuming the Commons actually facilitates a full or nearly full EU withdrawal (varying degrees have been debated), there will be no maintenance of the status quo. Instead, we should see several good results, as well as the rise of more than a few obstacles to the industry’s sustained success. Thus, the future of dentistry in the UK is perhaps at its most uncertain period in quite some time.